Lyle: These are open position dominant chords. The B7 was a tough one for me when I was a beginner. Terry: Yeah.....it's a great sounding chord, down low on the neck which allows you to play a B7 without having to do a bar chord. Lyle: Try setting your electric to either a clean or slightly overdriven sound, a vintage tone. Lyle: Now try playing rhythm riff 1 along to the looping jam track. Morrie: Alternate up and down strokes ? Lyle: All down strokes for rhythm riff 2. Lyle: Ready to learn a couple solos I made for this jam track? Lyle: Play the TAB back so you can see it on the virtual neck. 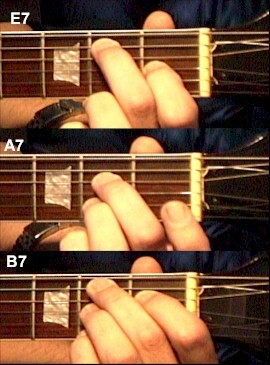 Lyle: This is a scale pattern I use to improvise with. It is a combination of the E minor and major pentatonic scales with the added flat 5 from the minor blues scale. blaise: What kind of amp are you running out of? Lyle: For this lesson I used a Rocktron Voodu Valve preamp direct into the pc soundcard. Lyle: Now you can pick and choose which lead riffs you like and try building your own solo. You should have a fair amount of stuff you can jam with now!